Home decor magazine Domino is hosting a holiday pop-up shop at retailer Fred Segal in Los Angeles this month. Domino says it is the first publisher to create an experiential space in-store at Fred Segal, at the store's new Sunset Boulevard flagship. The magazine's editors partnered with CB2 to curate their favorite items from the furniture and decor company to display in the store, including copper flatware and multifunctional glassware. The editors also selected holiday gifting and housewares from up-and-coming designers and artisans. The pop-up is one of two holiday shops Domino is launching this season; the other opened earlier this month in New York City’s SoHo neighborhood in partnership with The Home Depot. Domino opened three brick-and-mortar activations in New York in the past year. The first was in NoHo last December, followed by pop-up shops in Brooklyn and the Hamptons this summer. Domino partnered with brands like Target, Jet.com, Pratt & Lambert, Illy Caffe and American Express for the shopping experiences. "We have had increasing success with our pop-up retail programs,” Coyle told Publishers Daily. The magazine chose to expand to the West Coast because Los Angeles is “a very important media market and also the center for the entertainment industry," he said. “We are excited to introduce our brand with a physical presence to this community." Editors will also offer workshops on hosting holiday parties, giving tips and advice on table setting and arranging, wine pairings and music playlists. 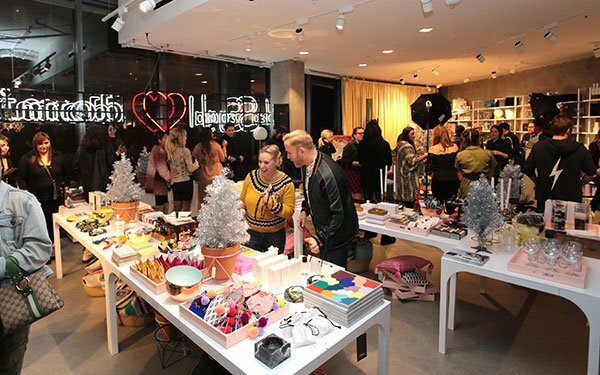 For the pop-up in Soho, Domino put together a holiday-themed location that features Home Depot décor, materials, products and furniture, from a fully functioning kitchen to dining areas decorated with items from Home Depot’s site. Proceeds from the SoHo location’s sales will be donated to Habitat for Humanity, as will some elements of construction, such as the kitchen and appliances.